Until now, it’s been pretty easy to save individual webpages, PDFs and text selections to your Evernote account using the Web Clipper. The feature set was limited, but the tool was lightweight and saved you opening and closing the full-blown Evernote app every 10 minutes. Today, the Web Clipper for Chrome is getting a major UI overhaul, while bringing in a slew of new features previously exclusive to other Evernote products. For starters, the interface is now an elegant, narrow sidebar that reveals all of the available options in one go. As before, you can choose to select all of the body content from the current webpage, or a selection of text and images that you’ve highlighted manually. The option to save solely the URL has now been swapped out for a feature called ‘Bookmark’, which also contains a small snippet of the page for future reference. 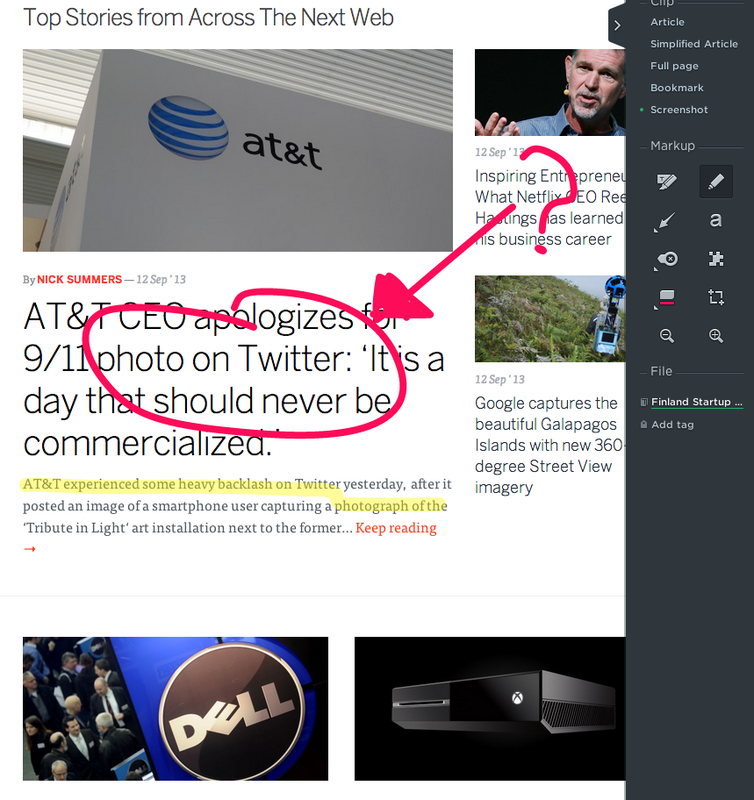 There’s also a ‘Simplified’ selection for a distraction free, Pocket-style reading experience in Evernote. Stacked underneath is a group of new icons representing markup tools from Evernote’s companion app Skitch. Before saving the page to a particular note or notebook, you now have the option to highlight some of the text, draw all over it with a marker pen or add your own typed comments. If you’re worried that you might forget why you saved a particular webpage further down the road – if it’s stacked with text, that’s probably a common occurrence – this is a good way of adding a quick crib sheet. For enterprise users, the ability to add brightly-colored stamps, arrows and shapes should also keep your web clippings looking neat and tidy. The revamped Web Clipper also comes with a share option at the bottom of the sidebar, which lets you send the current clipping – with or without your own personal annotations – to friends or colleagues via Twitter, Facebook, email and Linkedin. It’s available right now in the Chrome Web Store – Evernote says a “special version” of the Chrome browser will also be released shortly with the extension pre-installed. No word on a roll-out to other browsers such as Internet Explorer, Safari and Firefox just yet.